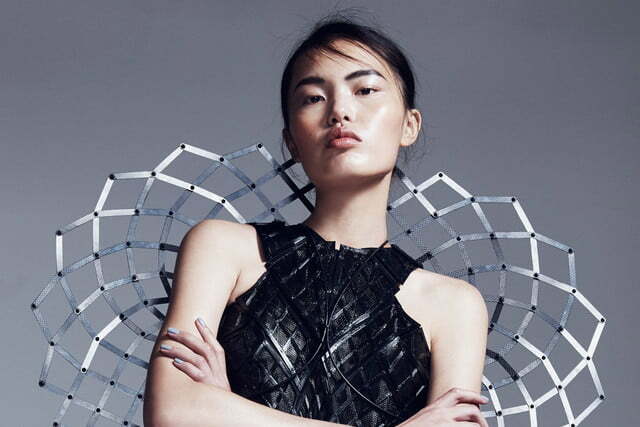 Intel’s Adrenaline Dress is the newest addition to the unexpected genre of wearable high-tech fashion. The design is a collaboration with fashion designer Becca McCharen and her sportswear and lingerie label, Chromat. Between Intel’s tech and McCharen’s design prowess, the Adrenaline Dress was born to respond to the wearer’s stress levels and adrenal function, and change its shape accordingly. 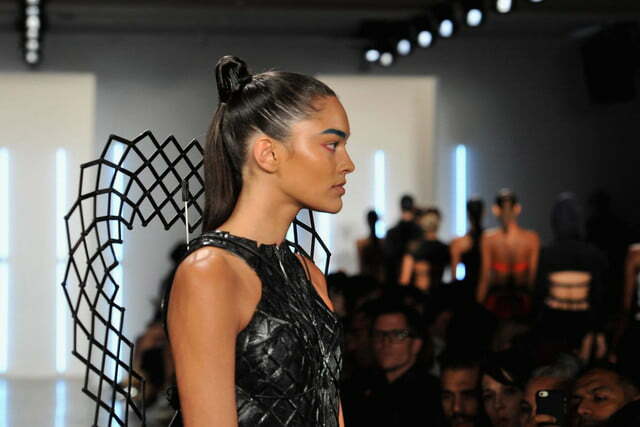 McCharen’s background in architecture and urban design inform her fashion creations in the Chromat line. 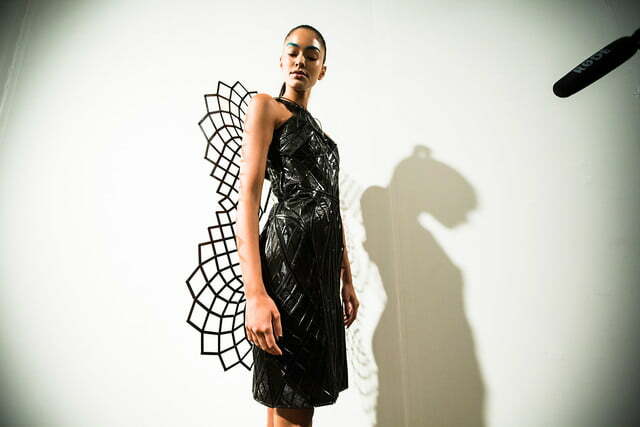 As “structural experiments for the human body”, the Chromat aesthetic fits seamlessly with the tech sensor suite that Intel packed into the dress. The Intel Curie Module is a tiny computer the size of a button, and it’s already in use in many wearable devices on the market. The sensors in the Curie Module detect and analyze the wearer’s biometrics, including perspiration, breathing patterns, and body temperature. The Curie Module sensors allow the dress to respond to both internal and external stressors by growing and shrinking based on the wearer’s biometric response. The dress itself is made of a memory alloy that can restore itself to its original shape after stretching or shrinking. 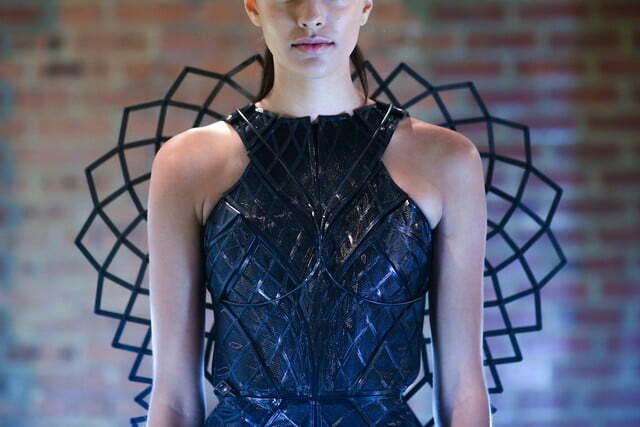 It also incorporates neoprene, 3D-printed nylon, and Chromat’s signature corset boning. “By serving as an extension of our sensory systems, the responsive garments reflect a concept known as biomimicry, where nature is used to solve complex human problems” said Chromat in their statement on the project. Heightened adrenaline levels can manifest in body sweat, rapid breathing, increased body temperature, and more physical symptoms that the Curie Module detects. When adrenal function shifts, the frame of the dress expands to replicate the natural human instinct for fight or flight. High adrenaline levels will cause the dress to expand to an intimidating size, similar to many animals’ natural strategies to scare off predators. When stress levels return to normal, the dress shrinks back down in size thanks to the memory alloy, indicating that it is safe to approach the wearer.